Very comfortable pillow. I used it during my pregnancy and after. This user was entered into a sweepstakes after submitting their honest review. Cradle your body in optimum comfort with this body wrap pillow. Wonderfully suited to a side sleeper who is small in stature, this pillow can be used to bolster your bed support, help you sit, and lend you unique back support while sleeping. The curve of the pillow relieves pressure on your back and joints while you rest, and comes complete with a removable cover for easy maintenance. This pillow was purchased as a gift for my dad, who has Degenerative Disk/Spinal Stenosis, etc., because it appeared to be just what he's been looking for. He wanted the pillow to sort of "cocoon" him, giving him support all around his body, and because it looks exactly like that's what it would do, I couldn't wait to give it to him. Well for one thing, the fabric is hard, stiff, scratchy, and incredibly hot, making it nearly impossible to be comfortable in/on. More importantly, the pillow itself just didn't perform as it was touted to. It flattened out quickly in spots making it slightly lumpy, so the support just wasn't there. There were a few other minor issues of lesser concern, but those two things seem to be the most problematic. For anyone deciding to go ahead with this purchase, at the very least, I highly recommend making (or having made) a pillowcase with a high thread count cotton fabric, for comfort and perhaps to help with keeping it a little cooler. The existing cover can literally make you perspire profusely if it's right against your skin. Of course, this will be one enormous pillowcase, as the pillow is truly gigantic! Best of luck to all! I ordered this pillow to replace the 8 pillows I had to arrange every night in bed to get comfortable because of my Arthritis and Fibromyalgia. I did read all the reviews, had a open mind and was ready to review this pillow. It is indeed big, but I don't fit in it like the woman on the photo fits in it. I'm a voluptous woman and am almost 6 feet, so I'm big. The pillow is a bit stiff when you start using it, but during the night it kind of flats out in the middle where you're sleeping on it. I have to re-adjust it several times during the night. I was hoping for good back support while my arms would also be supported at the other side. That doesn't happen for me but that might have to do with my size. There are 2 things that disappointed me, the quality of the fabric is really rough, and there are no shams available. I cut open a king size sham and pulled that over the pillow somewhere near the middle where I can lay my head on. They other thing is the chemical smell that still seem to linger after the 3 weeks that I have the pillow. Overall I wouldn't buy it again but would recommend it so a smaller friend. My significant other bought me this for my birthday because he travels alot. I told him cuddling with a reg pillow dont help me sleep when hes gone. He got me this over sized body pillow and I really love it. I use it all the time and sleep like a baby. the only down side is when you wash the outer cover have to be very very careful because the pillow is not easy to get back in and the mesh is very easy to put a hole in. I have fibromyalgia and rheumatoid arthritis. After reading all of the reviews on this product and how it helps with these particular conditions, I was convinced to buy it. The reports of comfort and better sleep seemed to override the consistent complaint about the scratchy pillow cover. When it arrived, I simply covered it with a sheet and will sew a cover at some point. However, I do think it behooves the manufacturer to supply a better pillow cover, and to possibly offer one at a discount to those who have already purchased the pillow. I'm still working on how to best use the pillow, but I will say that it does mold around your body nicely. The extra support on the back is helpful, as I've been rolling up towels and using small pillows to supplement the king size pillow I was using. The only negative for me is that it does tend to retain body heat. I have and will continue to recommend this pillow. 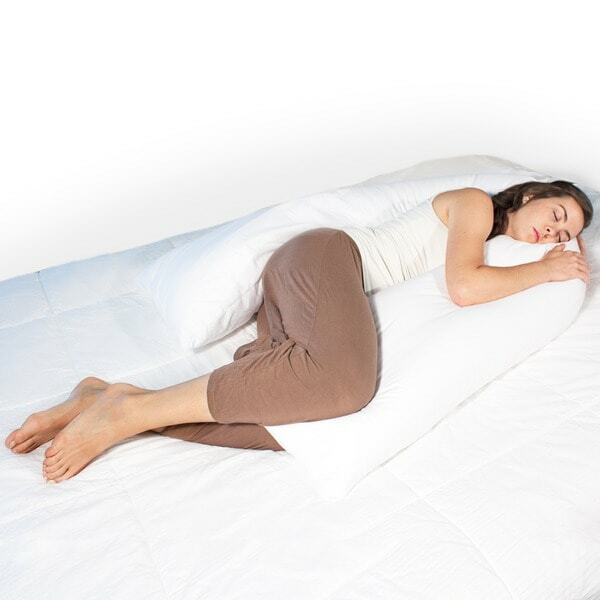 The total wrap pillow gently supports each joint and provides for proper bodily alignment. I would highly recommend this over-sized body pillow for anyone with joint disease, whether rheumatoid arthritis, osteoarthritis, or back ailments. PLUS it is a superb thermal conservator! It keeps you warm all night with minimal blanket weight. It is easy to make a pillow slip and the zippered cover can be removed for laundering. 1st night, slept all night! I've had the Body Wrap Pillow one night and loved it. The cover doesn't feel as soft as I'd like but I can make another cover for it. It was literally like pillows being wrapped around your whole body and none of them moving when you turned from one side to the other. If you're a side sleeper, this is the pillow for you. It's definitely worth the money! Yeah, the cover is a little rough, but SO WHAT? This is a WONDERFUL pillow and I'm so glad I got it! The cover softens with use/wash, and a different pillow cover would solve THAT problem anyway! Fluffs up again and again. I've always WANTED to sleep on my side, but couldn't because it made my shoulder hurt. I use one pillow under the body pillow in order to get enough height/support so my shoulder isn't smashed into the mattress. If I could use 4 of these things at one time, I WOULD. Going to make a pillow case for it from an old, worn, supersoft sheet. If the pillow was even twice as long, I'd just keep wrapping it around for more snuggle comfort. This is a very comfortable pillow that has made sleeping on my side easy. I like that the case is removeable. But when I first washed it, it is difficult to zipper again. I would recommend a lower setting of heat when drying. I liked it so much I bought one for an expecting friend. It's soft and easy to wrap around you. I also like how light it is because it's easy to move around. I have problems sleeping but this pillow has helped me get a good nights rest. It could be longer. I am 5 feet 7 inches and it only comes below my knees and 1/2 way down my back. The cover is very rough. Be ready to make a new cover. I bought this pillow for my picky fiance about three months ago. He had been looking for a good body pillow for sometime and I thought this would be perfect. He says that it is comfortable but the quality is really lacking. He took the case off to wash it and the pillow inside is a lesser quality than an airplane pillow. We barely got the case back on without ripping the pillow inside. Also the stuffing does shift quite a bit. Overall it is ok but it should be priced at a third of what it actually costs, especially because it is impossible to find a decent pillow case for it. I thought that this pillow was a wonderful item. The value was great and the comfort of the pillow is wonderful. It is surprisingly large, It hangs off of the king size bed we have but my wife and kids all love it. The only down side is that the pillow cover is a very course material, even after several washed it is still scratch and stiff. Still a good value an d comfortable pillow if you make your own pillow case out of nicer material. You can't buy a pillow case this large, believe me I looked. I would recommend this to others as a definite value. If your 5'2" and under then this pillow would work. I'm an average 5'9" and it's way too short, it hits me above mid thigh. It seems to be a bit too firm also. I received this as a Christmas gift from my husband....it was difficult to tell him that the pillow just wont work, could he please return it. Most whole body pillows are around 130" long, I believe this one to be just under 100". So, to make a long story short, I would not recommend purchasing this pillow if you are of average height. Love this pillow. It's very sturdy. When you lay on it, it holds it's shape. It doesn't squish flat under your weight. I purchased it for a very, very tall person (6'10"); and it's fits him wonderfully. If you happen to be shorter than 6'10", it's wraps around you; if you are 6'10", it works as a full length body pillow. I purchased this pillow for my daughter who is expecting. She has told me that since getting this pillow, she has been able to sleep better and no longer has any back pain. I can't think of a higher recommendation. I love to hug something while sleeping so I purchased the total bod wrap pillow and truly love it. It is comfortable and you can bend it to form around your body. I sleep on my side so it is perfect to wrap your legs and arms around. My mom sleeps on her back so I got one for her so she could snuggle in the middle of the pillow. The pillow is firm and long enough to comfort you from head to toe. If you like holding something while sleeping, this is a great pillow to buy. I needed something to go from my ankle to my neck, so it's either a bit too long, or a lot too short. The lady in the photo must be about 4' tall. The wrap-around concept is a great idea (these body pillows are a pain when you turn from side to side), but if you need anything lower than maybe belly support, it's not going to work on both sides without turning (and then the bit flopping around behind your head is even more trouble than the standard 4-5 foot body pillow). Still, my arthritic knees and ankles are grateful. I'd also like it a little bigger around....it's narrower than standard body pillows. I still end up with my hand on the mattress and my wrist bent back....pins and needles in the morning! The last thing is the polyfill. Bend it a few times in the same spot and you're left with a dead spot. It doesn't really mush back together very well. Aside from the length, which really is an advantage in spite of the too-short-or-too-long issue mentioned before, the other thing I really like is the light weight. It's got feather or down body pillows beat, hands down. All in all, a pretty good buy. Really the only one I've seen that has that extra length....a definite double-plus! I was disappointed in this body pillow, I didn't get a good night sleep it was flimsy. I would not recommend this. Very comfortable pillow. I used it during my pregnancy and after. I really like this pillow. It is comfortable, and adjusts to your sleeping position in a way that provides back support. Although I bought it years ago, it has held its shape nicely. Well made, and durable. Only negative is that I have found it difficult to find inexpensive pillow covers for it. I liked this pillow, but it took time to become accustomed to. Now, it is hard to sleep without it. I have fibromyalgia and it is difficult to find a comfortable sleeping position. This wrap pillow has helped immensely. I definitely recommend it. Very comfortable! Makes sleeping so much better, I love mine (and I’m not pregnant). This is an amazing addition to my sleep routine. It’s hard to wash that’s my only complaint. Big and this will wrap you up! "I need to "block" the opening along the top of my king size bed ... how long is this item since there seems to be some confusion here about this?" Hello sisterblue, thank you for your inquiry! We were able to confirm with our support team that it is approximately 100 inches long. I hope this helps. Happy shopping! "I need a cover for tis size body pillow zippered if posible"
Hello ldlpainting, I apologize but we do not currently have pillowcases for this body pillow. I would suggest doing an online search to see if you can find a pillow case that is longer than 107 inches long. I did not have much luck finding a pillowcase made specifically for this pillow. I hope this information is helpful to you. Thank you for shopping with us. "what are the correct dimensions? it is NOT 17X102. Thanks,"
I am another person who received this item as a gift and I can assure you it does not measure 102" long! I suggest overstockcustomerservice take one out and measure it. Otherwise they are sending the wrong item out to the buyers! "are there pillow cases for this"
Unfortunately, we do not carry any pillowcases for this pillow. "is this pillow considered firm support for side sleepers?" This is a polyester-fill pillow, so it is not going to be very firm.